This was a weird and amazing rock show that I just had to post about. 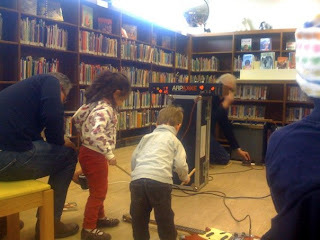 FOOT performed some crazy psychedelic noise jams for the tots at the Windsor Terrace Library Toy Sale Saturday, Nov 22nd. 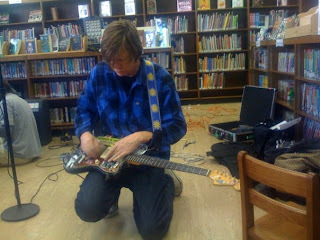 FOOT is Thurston Moore on guitar and effects, Don Fleming on guitar and synth, and Jim Dunbar on synth and electronics. 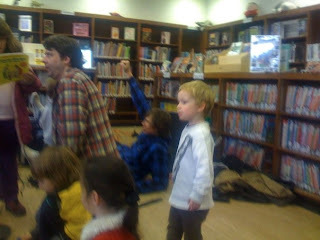 Children read excerpts from picture books over the squall and eventually joined in bashing away on the instruments. Here's some photos and a little sample of the sounds created that day. My son JoJo is the one in the white shirt. 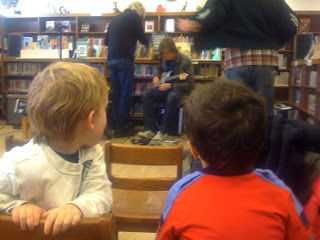 Listen to some FOOT at the library! Throughout grade school and high school, all I wanted to be when I grew up was a cartoonist for the funny papers. I assumed there could be no greater glory than to have your art lining the bottom of birdcages or used as birthday wrapping. Which is to say, Berkeley Breathed was my idol. Years ago I came to my senses. About my career, not Mr. Breathed, who remains a hero. And I'm so happy he's making picture books for the little ones these days, because I want my kid to have the chance to know (and love) his cracked point of view. 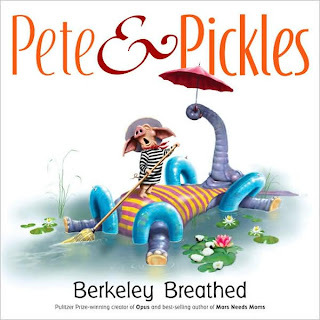 Pete & Pickles is a charmer, though not without a few dark notes to give it an edge. Starring a widower pig (Pete) and an adventurous escaped circus elephant (Pickles), the book is filled with the antic exuberance and skidding non-sequiters that made Bloom County and its characters so memorable. And the art is super-plush and totally weird, racing through a catalog of famous artists and styles. Check it out, and don't forget that Mars Needs Moms! Oh, and it's almost Christmas. Opus & Bill make for a wacky noel in this great picture book and the animated TV special from back in the day.